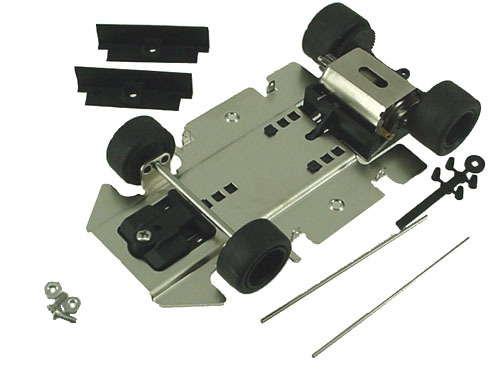 T32002 - 1/32 Scale Ready-To-Race Chassis [T32002] - $54.95 : TSR Slot Cars, TSR Slot Cars - Dedicated to Slot Car racing, collecting, restoration, track design, electronics and software. 1/32 Scale Home-Racing Chassis in Ready-to-Race form For Use on Carrera and most plastic tracks. One traction magnet is supplied with each chassis and its use is recommended with stock tires. The use of a 2-amp variable voltage power supply and PM electronic controllers is highly recommended (please check our controller catalog). This chassis comes with 2 types of body mounts. We recommend the use of the Automatic Body Mounting Tool, part # T3207 when using the pin-tubing mounts. Supplied with Gevon rubber tires suitable for plastic tracks for use with traction magnet. If used without a traction magnet, we recommend the use of THP3212 rear tires.